Already a big name in French sport, white water canoe slalom emperor Tony Estanguet will become a giant if he can claim a third consecutive gold at Beijing. His status is so great that he has been offered the distinction of carrying the French flag at the opening ceremony. From the Pau region at the foot of the Pyrenees the now 30-year-old champion of the Sydney and Athens Games grew up carting canoes to rustic mountain river descents with his dad and brothers, slalom enthusiasts one and all. "My Dad was an international kayak racer and he had us all in boats from an early age me and my brothers Patrice and Aldric went out looking from streams every weekend and every holiday, in Spain, everywhere," he says. His elder brother by five years Patrice was himself an Olympian and won a bronze medal at Atlanta while Aldric made the national team before becoming a physical education teacher. But Tony, world champion in 2006, European champion in 2000 and 2006, and twice a World Cup winner looks set to put the family name in the hall of fame. "It's thrilling. It'd be a dream come true to get a third straight gold, that goes beyond the sport itself," he says. This solid and optimistic man will enter an elite clique should he become a triple Olympian, he was only the seventh ever Frenchman to actually defend an Olympic title at Athens. 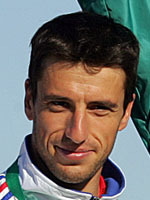 He grabbed his first title at Sydney and defended it in slightly fortunate manner when Slovakia's Michal Martikan, Atlanta champion, Sydney silver medallist and four-time world champion, was fastest at Athens only to be hit with a two-second penalty, handing Estanguet top spot again. A complete paddler, powerful, skilled, instinctive and self confident he is also a lucid and sensitive man who has come out against a boycott at Beijing. "Sports people aren't going the change the world. This is a political question, we should respect the Olympics," he says. Respect is something he himself has gained, something which will serve him well out in China on his unique quest for a third slalom title.